Montana receives a letter from his mail order that she will be arriving soon, way ahead of schedule. They've written to each other a lot over the last few months, but what will she think of his family and his home? He will soon find out. Mary feels as though she must leave her aunt and uncle's now, immediately. Her former suitor that she had been writing is not taking the hint and the last letter made her somewhat afraid. So she begins her new journey to meet her new husband. 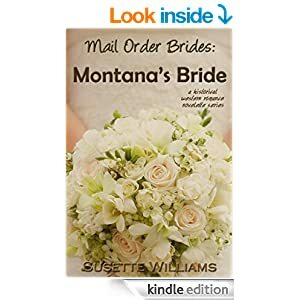 The author Susette Williams packs a lot of action, laughter, and romance into this short story to keep you flipping the pages to find out what happens. I enjoyed reading about Montana and his mail order bride but I was most intrigued about Montana's Mom. I would have loved to read more about her and her hardships she faced. Although I miss the in-depth details of a regular sized book, this would be great for when you just have a few precious moments just for you.